I guess you guys have lots of documents to print out. There is a smart way to cut down on printing expenses. You only need an app named “Add2paper”. Add2paper is a corporate sponsored free printing app. It puts an advertisement at the bottom of your printed paper for offering you a free printing service. It’s pretty simple to use. Go to the App-Store and download the ‘Add2paper’ application. You can sign up just by writing the university you are in and entering a certificate number. You get 10 sheets of free printing after signing up. Visit the app every day. you can get 2 sheets per day only for visiting the app through your smartphone (the collected free sheets expire after 2 months). This means, you can save up to 42 sheets in a month if you visit the app every weekday. Click on the advertisements, share or “like” them with your Facebook-Account. Per clicked ad you receive one free sheet. A linkage on Facebook earns you 3-5 more sheets. Invite your friends. 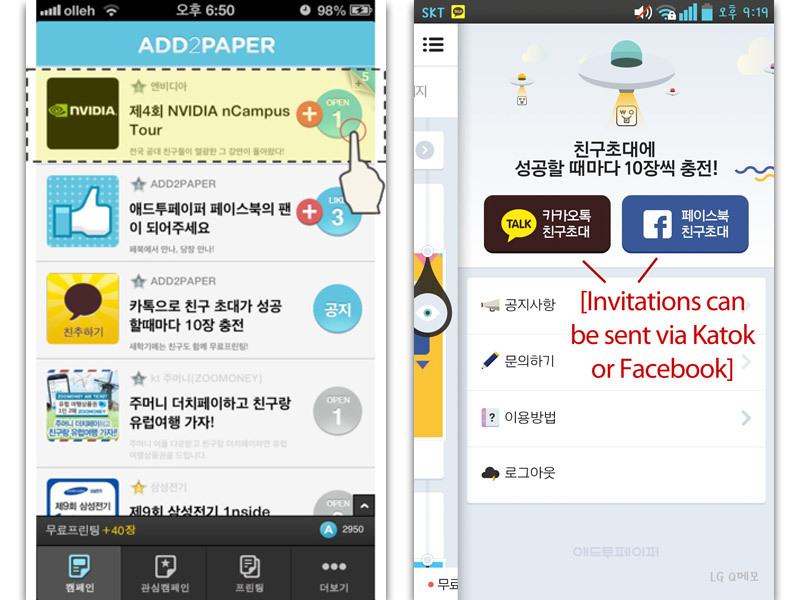 Let your friends know about this app with the friend inviting service of Kakaotalk. You can get additional 10 sheets for each person you invite. 10 sheets for 1 person, 20 sheets for 2, and 100 sheets for 10 people! You have to use Add2paper PCs to take advantage of the free sheets you have piled up. Add2paper PCs are located in the PC room at the second basement of the business school building. The way of printing is similar to usual charged printing. Open the file you want to print out, click ‘printing’ button and then a pop-up shows up. Enter your ID and password. Then click the button labelled “FREE(무료)”. After a short while, your document will be printed out from the printer besides the monitor. Now, try downloading the Add2paper app and enjoy the free printing service!